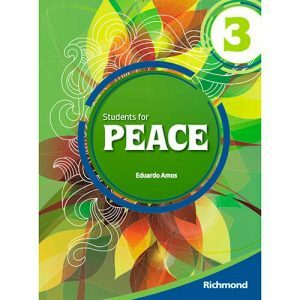 Students for Peace (SFP) is a four-book series whose cross-cutting theme is Peace Education. It was originally designed for Brazilian 6th to 9th graders with ages ranging from 11 to 15. Each book is organized into eight chapters, comprising a total of 144 pages each. Each chapter is built around a topic which deals with one of the multiple aspects of Peace Education. The work with these topics also comprises activities that deal with various textual genres. Moreover, the series has a digital platform that resembles a social network where students can create their profiles and post their productions, allowing students from different places to read posts, react to them and even share them. The growing complexity of our social context presents deep challenges for those involved in education in Brazil. A number of areas like Financial Education or Traffic Education Programmes, for example, are still not present in pedagogical practices in Brazil. There is, however, an area which, in our view, should take precedence over any other, given its importance for all involved in the daily routines of schools – and that is Peace Education. It is in this context that Peace Education represents a priority which still has not been perceived as such, or worse than that, has been neglected or disqualified in the debates related to education in Brazil. already known. Because students come from different backgrounds with different life experiences, these differences are a key element in negotiating new knowledge. Students’ production is regarded as a process involving gathering, selecting and, organizing information along with a great deal of creativity. The process takes into consideration the textual genres being studied in the chapter and demands more than one draft. In Book 1, the starting point for students’ production is a concept map which helps summarize the main idea of the chapter. The production process does not end by handing ‘something’ in to the teacher. Students are encouraged to post their production in the Students for Peace digital platform which allows students from other parts of the country to access the content and interact with the producer. Another key feature of SFP is the closing section of each chapter. Named Peace Talk, the purpose of this section is to reflect on and discuss the topic of the chapter under the light of Peace Education. This is done by means of an activity that sets students on the path of social protagonism. They are encouraged to take action in their immediate environment (the classroom, the school) or in wider contexts (the neighborhood, the city, the web). teachers and students with an opportunity to go beyond the linguistic objectives of their respective syllabi. The concept of “English as a foreign language” and the fact that the teaching of English does not have enough prominence in the Brazilian school curriculum very often puts us at the margin of both school life and the whole curriculum. We wanted to bring to the classroom those questions which very often remain untouched. We wanted to cast light on the recognition and appreciation of others, the acceptance of diversity, the emphasis on diverse cultural values. And we wanted to empower teachers and learners to do it confidently. Biodata: Eduardo Amos is a Brazilian writer with a large experience in designing textbooks and readers for teens. He has a BA in Education from Mackenzie Presbyterian University and is a member of GEEPAZ – Study Group on Peace Education and Tolerance of the School of Education, University of Campinas, Brazil.